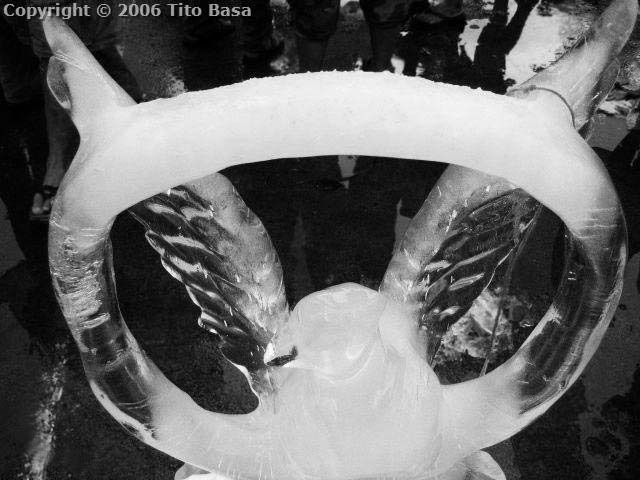 The Carving Capital of the Philippines annualy hold an ice carving contest on the 24th of July which is the day before the town fiesta. Global warming doomsdayers must be telling the truth since just a few minutes when the gates were opened to the public to see the ice creations up close, they vanished rapidly. Not that they melted-- they ended up in mugs of on-lookers rooting for free ice! Pictures taken with Canon Ixus 30, Photoshop used to blur background (something you can't do with a P&S camera but fairly easy on SLR). Black and white conversion using filters. Hwaw! Hanep panalo ito!! Hows your in-law who's an ice carver? Abroad na?